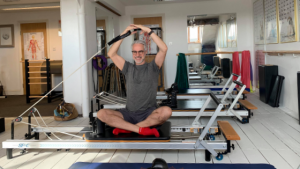 One of our case studies is Jonathan Foreman, 56, a company director who after illness and injury wanted to get fit for waterskiing. Why did you start with Pilates Studio Suffolk? I slipped a disc doing an inane movement and was in agony. It was the day before I went to Canada for a month’s holiday so that was a massive shame and waste. The pain and inconvenience it caused made me promise myself that this could never happen again! I asked people for recommendations and the doctor and physiotherapist recommended Pilates. After asking around I was directed to Pilates Studio Suffolk. Please describe your experience with Pilates Studio Suffolk. I discovered immediately that Millie wanted me to get stronger and more flexible . Not just to have me turn up and take my money . She helped me make the correct level of muscle activation and movement so I would recover and then build. Some of the exercises were more about concentration rather than physical efforts and from the start I felt the benefits and really felt good about myself. What are the benefits you mentioned ? I had been ill for a long time and had become really weak; I was feeling my age, and if I am hones, I think I was feeling a bit down about it all. I have fun at the classes and I am considerably stronger and more capable because of them. I am running and cycling which before would just leave me with injuries. And I even took up waterskiing which really puts a lot of work on the body. I feel great. Would you recommend Pilates Studio Suffolk? Yes I would, Millie is devoted to getting people to be as good as they can be so you definitely get results. I wish I had gone decades ago. I think it is a vital class to take for any age group, and the antidote to ageing and age related disease is exercise & balanced meals, a social life and using your mind. At least I have the exercise part sorted and Pilates also helps stimulate the mind.